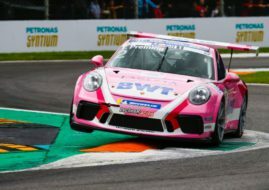 Michael Ammermuller won the Porsche Supercup race at Hungaroring and continued his quest to the championship title. Pole-sitter Ammermuller immediately lost his lead to Daniel Cammish but was able to hold off Dennis Olsen and Robert Lukas. However, on lap 8 Ammermuller regained leading position while two laps later Olsen overtook Cammish for P2. Ammermuller without too much effort scored his fourth win of the season to strengthen a lead in the standings to Dennis Olsen who had to settle for the 2nd place for the third time this year. Daniel Cammish completed the podium. Check full results at the SnapLap results page! 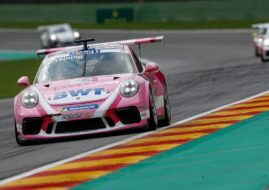 The next round of the Porsche Supercup is a double header and will go on August 26-27 at Circuit de Spa-Francorchamps.